The issue of the Sewage treatment plant (STP) to be built near Halga was raised at the Council meeting of the city corporation today. 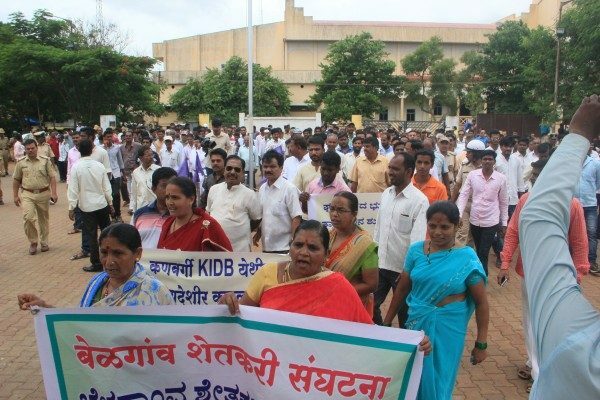 At the same time hundreds of farmers were protesting outside the Corporation demanding that the STP be shifted to another area which is barren land. MLA Belagavi Rural Sanjay Patil raised this issue at the begining of the meeting itself. MLA Sanjay Patil said the people of of Halga have have already given up their land for various projects including the Suvarna Soudha, but when it comes to safeguard the farmers the corporation never comes ahead to solve their issues. The villagers who are gave up the land for Rakaskop dam, are not getting NOC from corporation for drinking water supply from dam. Corporation should consider the plea of farmers and asked to pass a resolution to shift the STP project to Alarwad. Corporation commissioner Shashidhar Kurer said Belagavi has 53% of UGD lines but there is no STP. Hence it is very essential to develop the plant in Belagavi immediately. The sewage water is being released to Ballari Nala and Markandey river due to which various health hazards are on the rise. Corporation has given as affidavit to the Court for construction of STP and hence the revenue department acquired 19.20 acre land at Halga after the committee approved the location which comprised of Sanjay Patil, Sambhaji Patil and Feroz Saith. MLA Sanjay Patil said that as there is a lot of resentment from the farmers to give up their fertile lands, we must all honor them by shifting the STP to Alarwad by passing a new resolution to that effect.